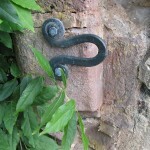 Forgework for restoration of mediaeval barn. 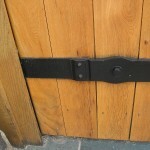 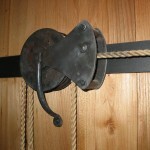 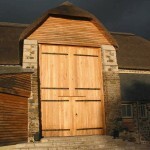 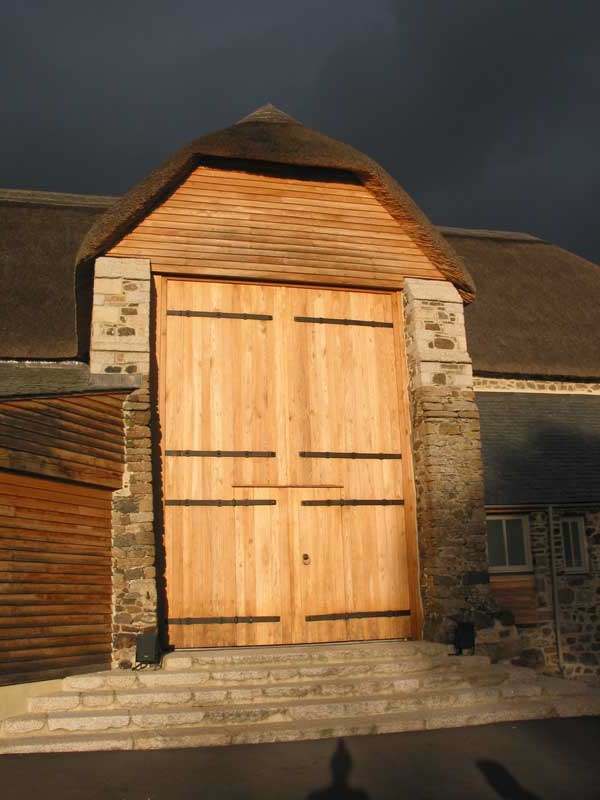 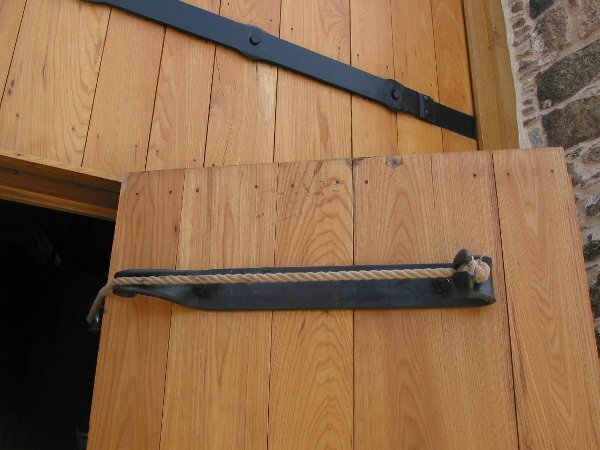 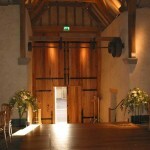 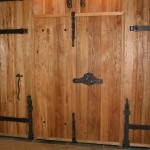 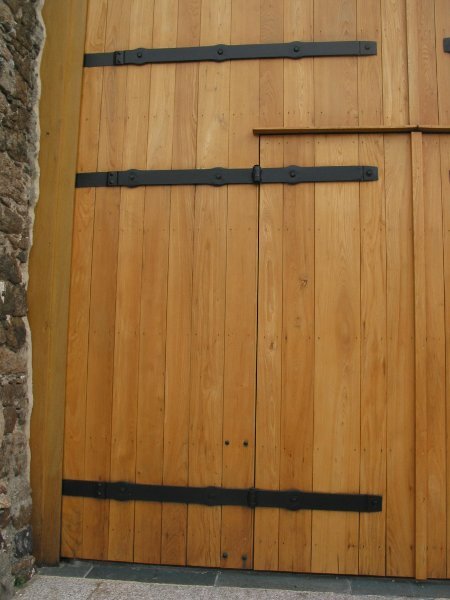 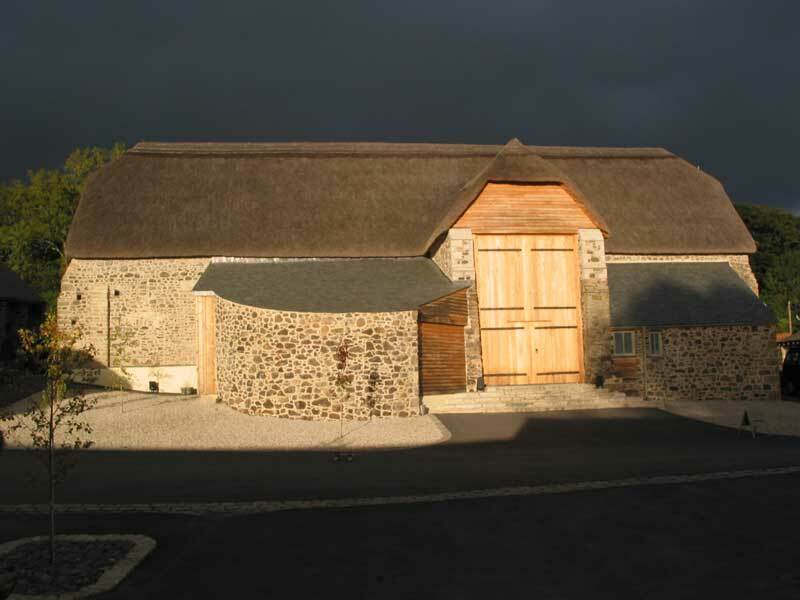 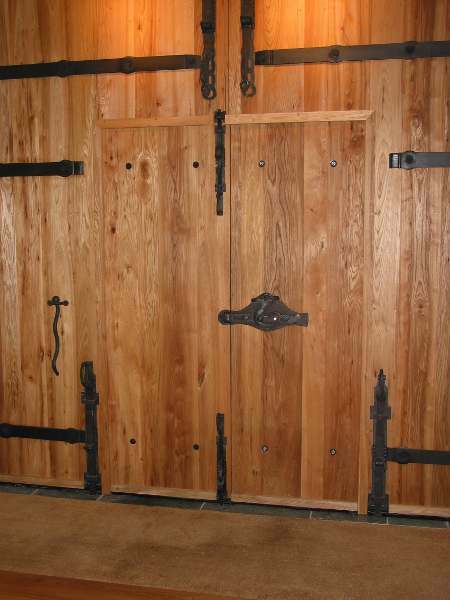 This mediaeval granary, which is now a venue for weddings and such events, required some large hinges and some long vertical action bolts for its main doors front and back, as well as various smaller doors around the building,The general views give some idea of the layout; the detail photos are of, firstly, the prototypes for the latches and bolts, (which were initially made for the “Hot Stuff” exhibition at the Devon Guild a couple of years previously), while the last two shots attempt to show how the main bolts work. 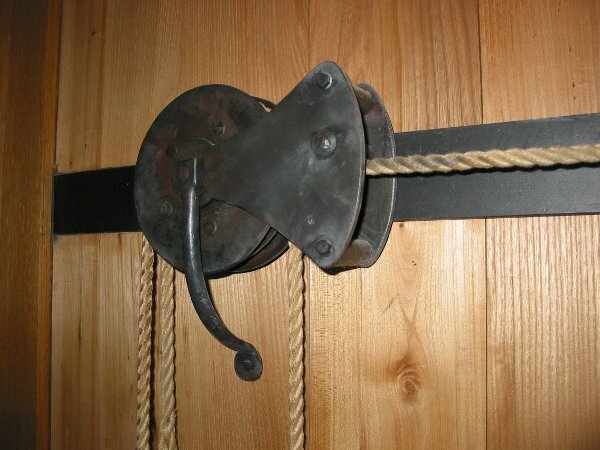 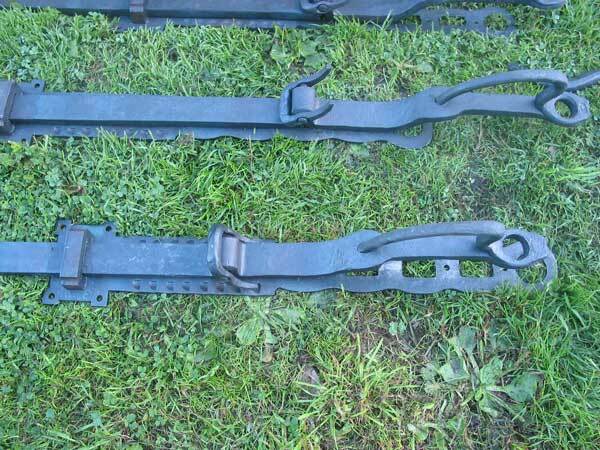 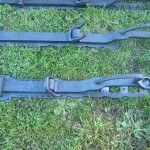 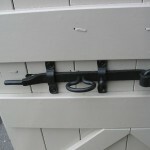 The latches, due to a misunderstanding, were fitted to the doors upside down; this meant that they lost their facelike character, which can be clearly seen in the photograph of the mounted prototypes – but everyone seemed happy with them and as they worked just as well (some say better!) 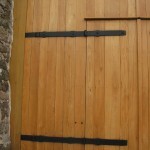 that way up, and as no one wished to make new holes in the doors, they have stayed like that! 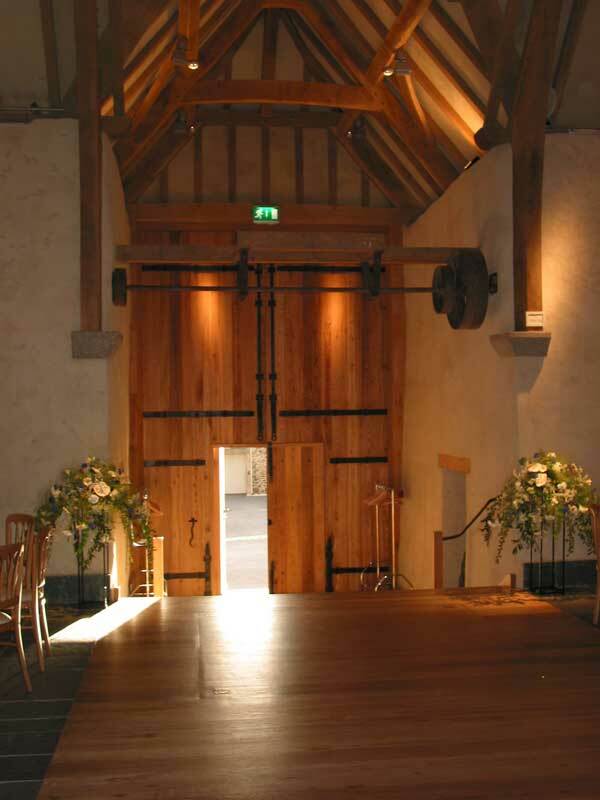 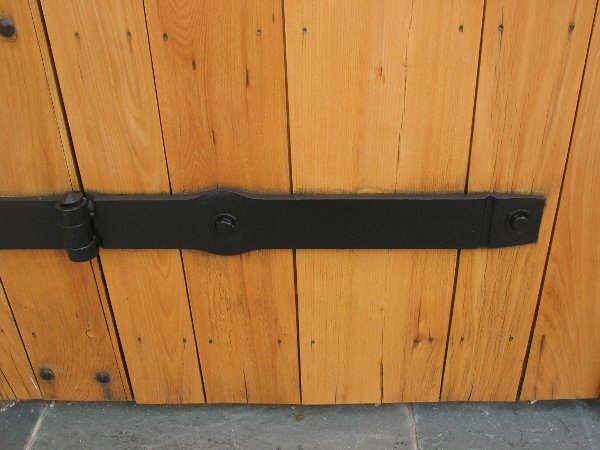 Some images of the strapping..
After a number of years of weddings being hosted at the Great Barn we were asked to solve the problem of the pedestrian access doors being too heavy for wedding guests as well as having a tendency to slam noisily at inappropriate moments. 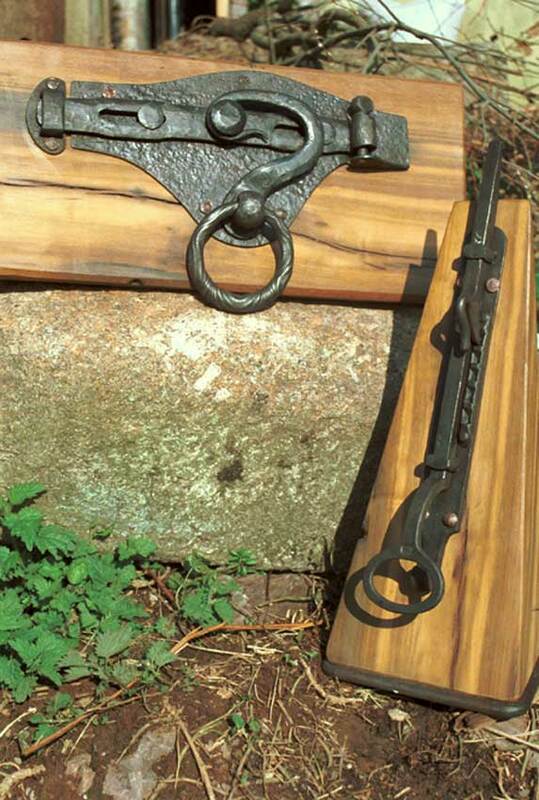 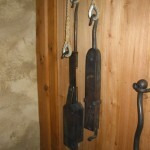 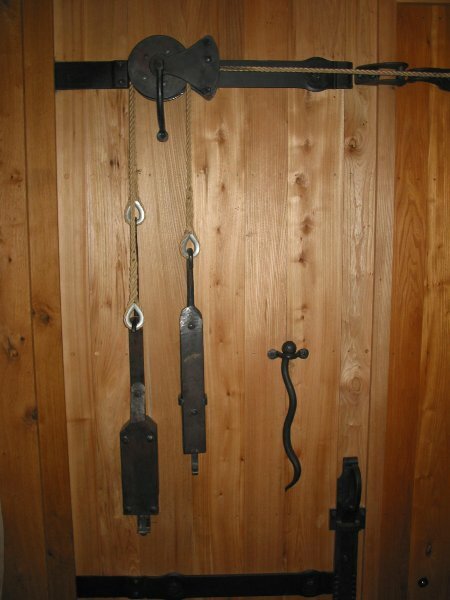 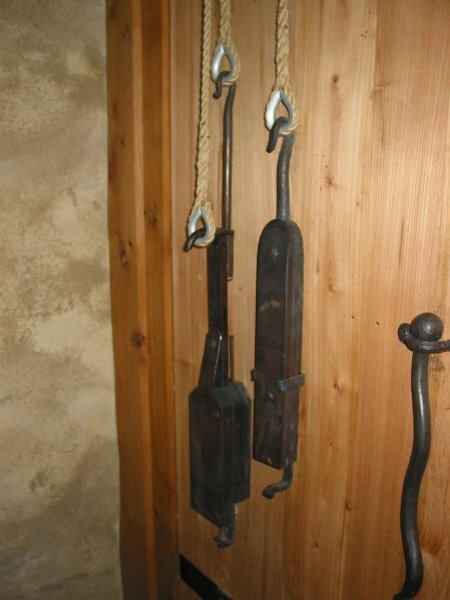 The arrangement of weights and counterweights illustrated below achieved this successfully, while retaining the feel of the other work on the doors. 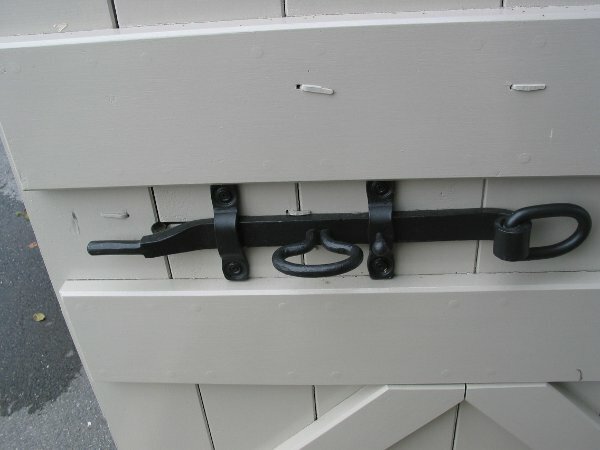 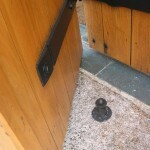 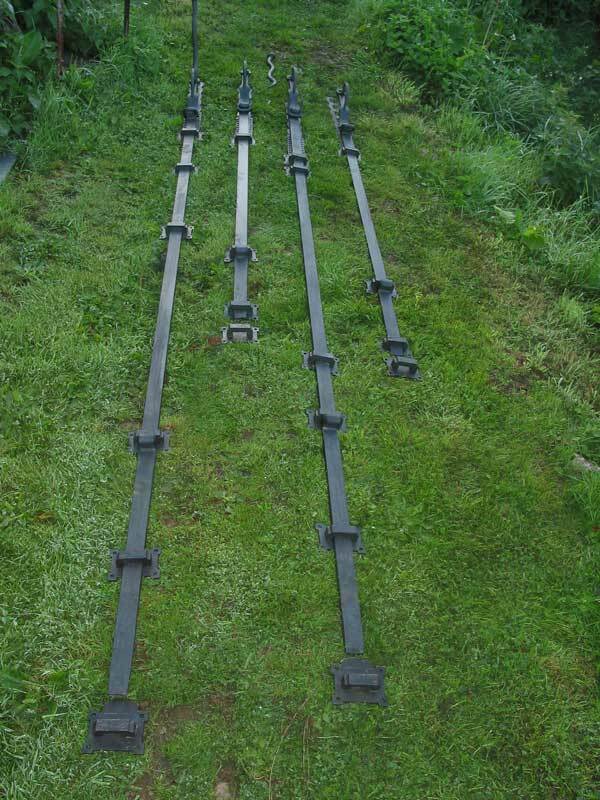 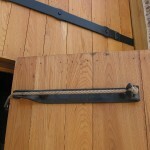 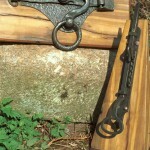 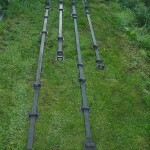 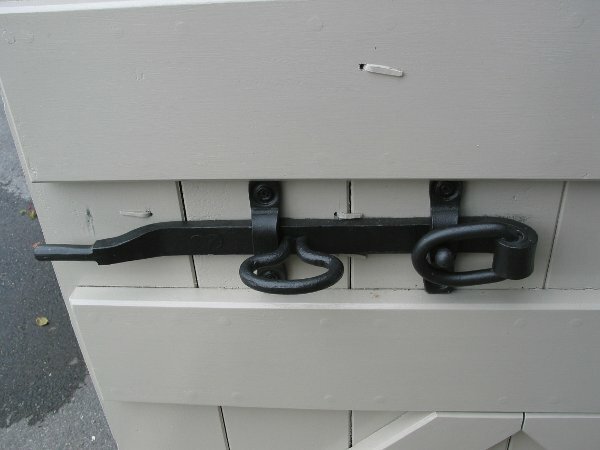 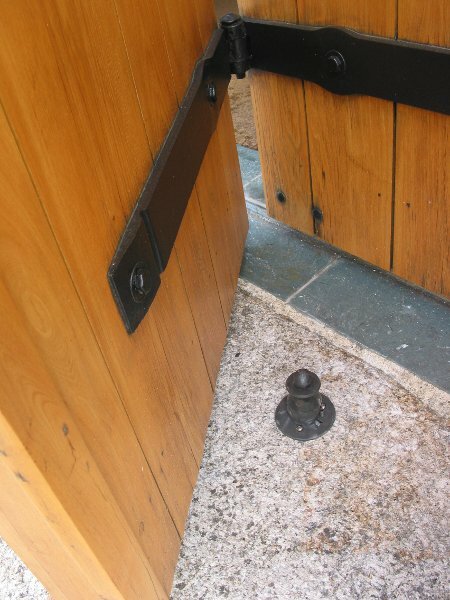 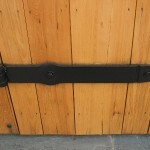 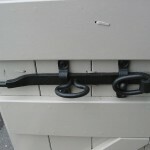 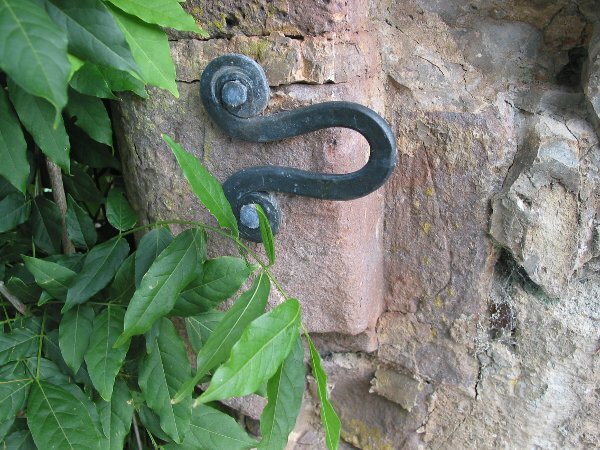 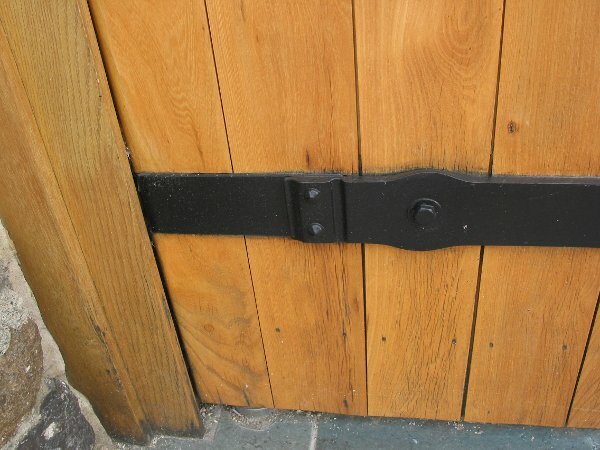 A ‘lockable from one side only’ slide bolt to the private area of the property was also commissioned .